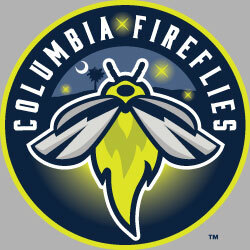 As chosen by the editors of Ballpark Digest, the 2016 award for Best New Logo/Branding of the Year belongs to the Columbia Fireflies (Low A; Sally League). The Fireflies partnered with sky design to launch their inaugural season with a look that balances innovation and community connection, creating an identity that turned into an instantly beloved classic. The Fireflies joined the Casper Ghosts (2008-2011; now the Grand Junction Rockies) as the only teams in Minor League history to wear glow-in-the-dark gear. Their colors were chosen in a more subtle fashion, reported The State’s Aaron Ransdell on August 4th, 2015, with their midnight blue symbolizing the sky above South Carolina coupled with the fluorescent firefly glow. A crescent hides in the top left of the logo, the same location as the crescent in South Carolina’s state flag. Interestingly, though, it was a different logo for the team that garnered even more love. Jesse Goldberg-Strassler is the voice of the Lansing Lugnuts and the author of The Baseball Thesaurus, from August Publications.